Egypt airstrikes on ISIS in Libya after beheading video. 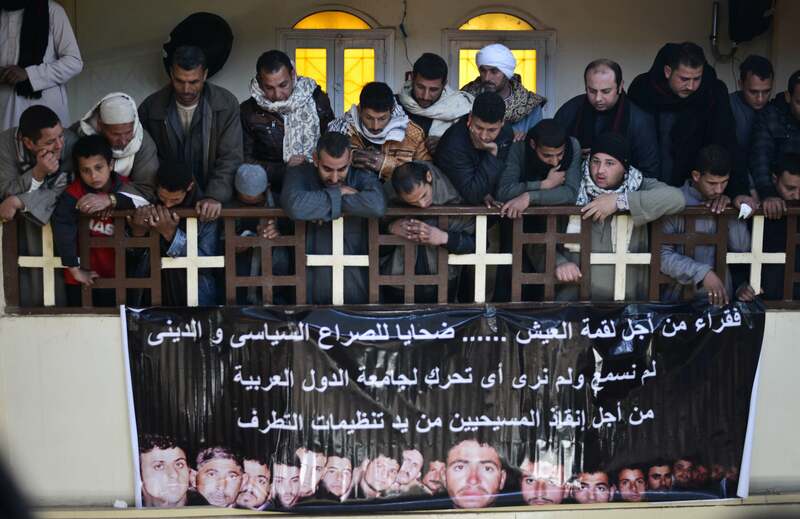 Egyptian Coptic Christians attend a memorial ceremony for relatives murdered by ISIS. Shortly after a gruesome video surfaced appearing to show ISIS-affiliated militants carrying out a mass beheading of 21 Egyptian Coptic Christians in Libya, Egypt took action, carrying out a dawn bombing campaign of ISIS camps and weapons stores in Libya. Libyan officials said the aerial bombardment of the militant-held city of Derna, near the Egyptian border, was carried out in coordination with Libyan forces, which reportedly participated in the bombing. “Avenging Egyptian blood is a national imperative,” the Egyptian military said in the statement. Libya has been in chaos, without an effective functioning government, since the overthrow of Col. Muammar Qaddafi in 2011. Egypt’s military intervention injects foreign powers into the ongoing conflict within Libya, and further drags the country into a broader regional conflict, as a new theater of war with ISIS. ISIS fighters claim to have made attacks in Libya before, and Egypt has complained about the growing threat the group posed, but the kidnapping and mass murder of the Egyptian workers, like the burning of a Jordanian pilot weeks ago, has again compelled governments in the region to become more active in the campaign against the militant Islamist group. Local media in Libya report that three children and two women were killed in the airstrikes in Derna, according to Bloomberg.